A Legendary Hunter minion and an Epic Priest spell were revealed earlier on an Instagram story by PlayHearthstone. Oblivitron seems alright. Not as bonkers as Kathrena Winterwisp, but still playable (given the right synergies). Spider Bomb might seem like the obvious combo...maybe Mechanical Whelp. Strangly it would work quite well with Flark's Boom-Zooka. But whatever it works with, Oblivitron seems slow...suuuuper slow. 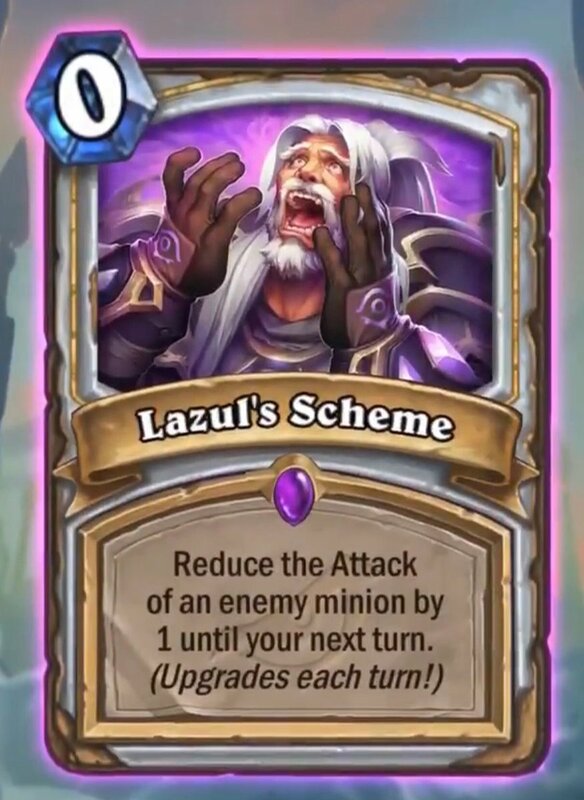 For Lazul's Scheme the only thing I can think of are the mindcontrol-mechanics (like Cabal Shadow Priest). Getting stuff in range for Shadow Word: Pain seems like a stretch - this would become a one for two. I agree, Oblivitron seems not great at first glance. And it had even worth stats and didn't do anything apart from summoning a minion. But it summoned from the deck, not from the hand. A huge advantage. Oblivitron will be meh for most decks. But maybe there will be some great combo (which I do not see at the moment, but I never see great combos until somebody makes a deck...). Lazul: I totally agree with you. Could be a funny card with Cabal Shadow Priest , but I am not convinced it will see much play. You need to have the card early to get some effect on turn 7 or something like that. If you draw it late, it is useless. But if you have it in your starting hand it limits your options greatly. AND you need to draw another card. I think I would use it to set the attack of an enemy minion down to 0, and then attack it with my own minions to kill it without losing health points on my minions. That way it stays 1-for-1. Bonus if the enemy minion had Poisonous or Lifesteal abilities - you work around it. Obliviotron remembers me of Voidcaller. Same stats, almost same effect, but 2 mana more and legendary. For me, is a no. And notice that it doesn't work with Mecha'thun as someone wrongly pointed out on hearthpown yesterday. Cube is strong because A) is a battlecry and B) it multiplicate the choosen minion. This is a deathrattle so it's slower, and it is more random, but you don't need to play the minion you want on board. So my opinion is that this card could have worked as a build around card for a midrange mech hunter.... if it costed less and if it was an epic/rare. This instead is a card you should put in an already built mech hunter deck, and in this case, it's slow so... I don't think it's good enough. And notice that it doesn't work with Mecha'thun as someone wrongly pointed out on hearthpown yesterday. Oblivitron summoned mech isn't forced to have deathrattle to be summoned. It's more a bonus. The reason you play such card is to cheat out a 9 mana minion without paying for it like Kathrena / Oondasta effects. As long it's a mech this thing summon it so you leave in hand a big mech to summon maybe even one with detrimental Battlecry. 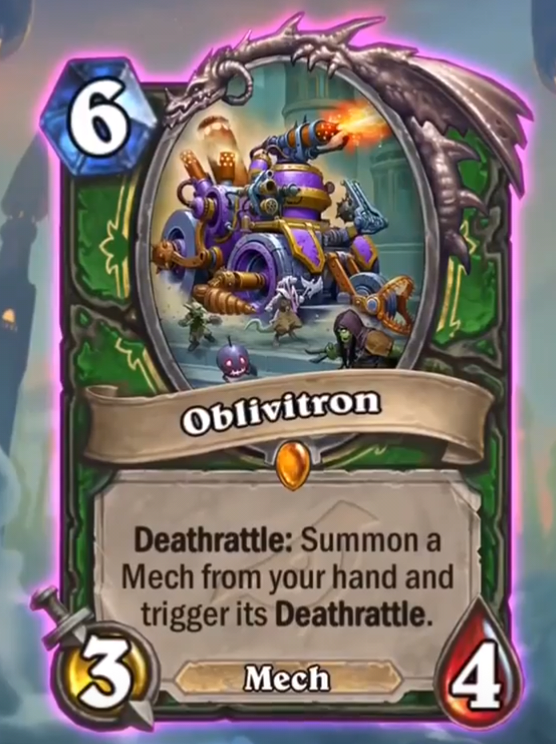 The card that will combo with this isn't revealed yet, but when you'll see a reveal of 8-9 mana Neutral or Hunter Mech it's the Obliviotron Buddy we were looking for. Well, it could work with a rush mech too... But it won't be that strong. Big beast hunter works with Kathrena because there exist 3 high attack high life charge beasts (King Krush and the 2 epic dinosaurs) and Oondasta that is both rush and summoning one of the 3 beasts from hand, so it is even more consistant. Yes, it can follow the Cubelock path, and work with a very big mech taunt.... But cubelock worked because he had more then a summoner from hand, he had both rectruiter from deck and summoner from hand and summon again from the grave. It is very stronger, even stronger in wild with voidcaller. If we get either a recruiter or a resurrect for mech, and a nice charge/rush or taunt NOT LEGENDARY minions, we can talk about it, but I bet it would still be too slow. 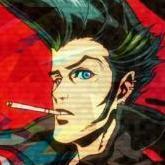 Oblivitron is slow, expensive, has terrible stats and its effect isn't that great since it only pulls it from your hand, and its on a death rattle. It is awful. The scheme is interesting. Priest has a lot of attack matters cards, the new forbidden card, shadow word pain, cabal shadow priest, etc, but it seems far too weak outside of those very specific combos, and those combos aren't even that impressive. Never discount 0 mana spells out of hand though. If priests get strong spell synergy it might see play simply because of that. My vote is still a no though.